> Ocean currents transport enormous amounts of heat around the world. This makes them one of the most important driving forces of climate. Because they respond extremely slowly to changes, the effects of global warming will gradually become noticeable but over a period of centuries. Climate changes associated with wind and sea ice could become recognizable more quickly. Water plays a central role in the climate system. Its ­density varies depending on salinity and temperature. Cold, salty water is heavy and sinks to great depths. This ­causes the circulation of millions of cubic metres of water in the ocean. This powerful phenomenon, which primarily occurs in a few polar regions of the ocean, is called convection. The surface water in the North Atlantic region sinks to a depth of around 2000 metres due to convection. There it settles on an even denser deep-water layer from the Antarctic that extends down to the sea floor. As the cold and salty surface water sinks by convection, salty water flows in from nearby warmer regions, from the direction of the equator. This water is then cooled in the Arctic air and also begins to sink, so that the convection is continuous. 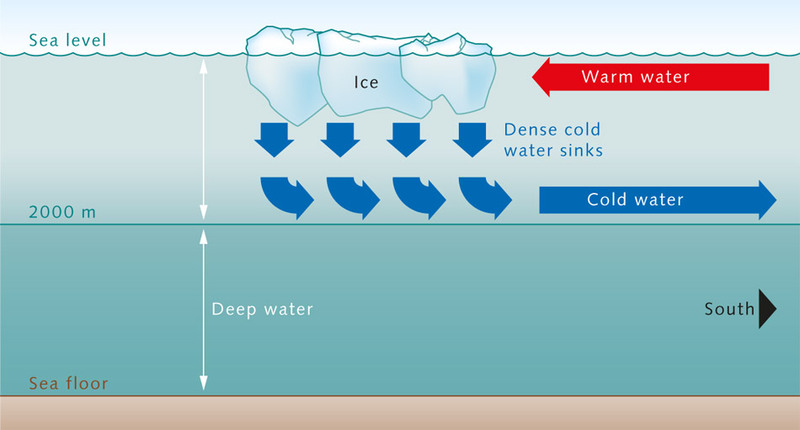 Before sinking, the water absorbs enormous amounts of gases such as carbon dioxide at the sea surface, and then transports them rapidly to much greater depths. That is why the highest concentrations of carbon dioxide in the ocean are found in the convection areas. The high carbon dioxide concentrations pumped into the water by convection have been shown to reach depths today of around 3000 metres. Carbon dioxide is transported relatively rapidly by convection to a depth of 2000 metres. In the North Atlantic the transport to greater depths takes significantly longer because carbon dioxide and other gases can only penetrate the deep water by slow mixing processes. Low temperature and high salinity are the primary driving forces of convection. They pull the dense water of the polar regions downward, which drives a worldwide convection engine called thermohaline circulation (thermo – driven by temperature differences; haline – driven by salinity differences). The cold, salty water submerges primarily in the Labrador and Greenland Seas, and then flows southward toward the equator and beyond. Although convection only occurs locally in the polar regions, it propels thermohaline circulation, which spans the globe like a giant conveyor belt. Even the Gulf Stream and its branches are driven by convection and thermohaline circulation. Although wind also influences the transport of water masses, its contribution is significantly less. 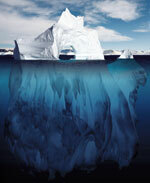 1.6 > The convection process in the North Atlantic: Cold, salty water sinks in the Labrador and in the Greenland Sea. This water forms a layer above the denser deep water from the Antarctic at a depth of around 2000 metres and flows toward the equator. Warmer waters from the upper ocean layers move into the convection area to replace the sinking water. But how do the water masses of different densities that drive ocean convection actually originate? Air temperature, evaporation and precipitation are among the most important factors in the answer to this question. The freezing of water in the polar convection regions also plays a central role. Because ice only contains about five tenths of a per cent salt, it leaves behind a considerable amount of salt in the water when it freezes, which increa­ses the salinity of the surrounding ocean water and thus increases its density. The water mass produced by convection in the Arctic is called the North Atlantic Deep Water (NADW). Convection also occurs in the Antarctic regions. Because of their even higher salinity, the water masses produced here sink all the way to the sea floor. This is called the Antarctic Bottom Water (AABW), and it flows across the ocean floor halfway around the globe into the North Atlantic. The AABW is also the deep water layer that the thick intermediate NADW overlies when it sinks by convection. The NADW forms in the Greenland and Labrador Seas. Figure 1.8 schematically illustrates its flow path and the return flow of warm water in the near-surface layers, in the global conveyor belt of thermohaline circulation. 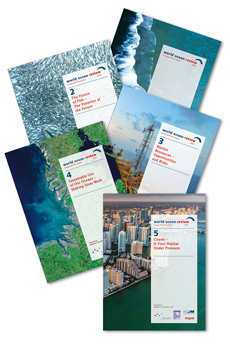 The NADW, and especially the AABW, remain in the deep ocean for an amazingly long time. Radioactive carbon-isotope dating of the deep waters indicates that from the time of sinking into the deep until its return to the surface, a period of several hundred or even up to 1000 years will pass. 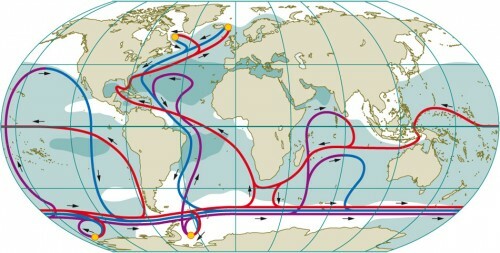 1.8 > The worldwide ocean currents of the thermohaline circulation system are extremely complex. The flow of cold, saline surface water (blue) downward and toward the equator can only be clearly recognized in the Atlantic. Warm surface water (red) flows in the opposite direction, toward the pole. In other areas the current relationships are not as clear-cut as they are in the Gulf Stream system (between North America and ­Europe). The Circumpolar Current flows around Antarctica, and does so throughout the total depth of the water column. The small yellow circles in the polar regions indicate convection areas. The dark areas are characterized by high salinity and the white areas by low salinity. Salty areas are mostly located in the warm subtropics because of the high evaporation rates here. For most of this time the water remains in the colder deep regions of the thermohaline conveyor belt because there the flow rate is slow, at around one to three kilo­metres per day, due to its high density. The amount of water involved in this cycle is truly immense. Its volume is around 400,000 cubic kilometres, which is equivalent to about one third of the total water in the ocean. This is enough water to fill a swimming pool 400 kilometres long, 100 kilometres wide, and ten kilometres deep. The oceanic conveyor belt transports about 20 million cubic metres of water per second, which is almost 5000 times the amount that flows over Niagara Falls in North America. There has been a great deal of discussion about the extent to which climate change could influence thermohaline circulation and its turnover processes in the Atlantic. After all, convection at high latitudes could be weakened by anthropogenic (caused by humans) warming of the atmosphere and the accompanying decrease in surface-water density. Additionally the density will decrease as a result of lower salinity in the North Atlantic. Climate change will probably cause an increase in freshwater input through a number of pathways, which will affect convection and thermohaline circulation. One way would be by an increase in precipitation over both the continents and the ocean. Another would be the increase of freshwater run-off from the melting glaciers to the sea. Furthermore, because less ice forms when it is warmer, the salt concentration in the surface water would not be increased as much by this process.